Formby Village, the heart of our town. Visitors to this blog might like to see what the 'Village' centre of Formby looks like, below I've added a Google application based on their 'maps' software combined with their 'street view' feature, I hope you enjoy it and get some idea of the special nature of the 'heart of Formby'. The wide pavements, mature trees and small independent traders help to mark out this space as a 'good space' in which to meet, shop, drink coffee and generally enjoy the view. Move your cursor over the map to activate it and to move around the village centre. I've suddenly realised that there are thousands of photographs of Formby on the 'web'. I've decided to begin a new series of occasional blogs based on photographs published on the internet. My thanks to all the photographers who've added their impressions of Formby to the 'flickr' web site. 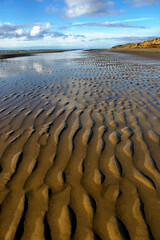 This first photograph will be very familiar to Formby residents who've walked on the beach just as the tides goes out. On Monday I attended the FormbyLive music festival steering group meeting held at Cafe' D'Art. There is now a Facebook Group for this festival and at the last count there were over 200 fans. On Tuesday evening I attended the usual monthly meeting of the Formby Parish Council Finance committee, these meetings are open to the public and are held in the Bier Hall at St. Peter's Church, Freshfield. On Wednesday morning I joined teachers, parents and children from all but one of Formby's schools for the inauguration of the 'Walking Wednesdays' project. I wrote about this in my last posting and I will shortly add a edited version of a video I made while supporting the event. For a 7.30am start the numbers involved was most impressive, well done to all the organisers and to the children in particular. Finally I have added a new link between this blog and my facebook account so that blog posting are shared on both web sites, let me know what you think. Formby Young People on the move! I've just received an email from the Head Teacher of St Jerome's Primary School, here in Formby, about an exciting event next Wednesday. "Next week all but one of the schools in Formby have asked the children to walk to Duke Street Park for a short gathering and warm up before leaving in school groups to walk to their respective schools. The Mayor and Mayoress of Sefton will be there and we hope Radio Merseyside will appear as well! The aim of the event is to try and see what Formby could be like if we all walked to school at least one day each week- our dream was for a traffic free morning but we know it is unlikely. Of all the primary schools we have nearly half of all children who have said they are coming, which is a good start. The idea is then to continue with Walking Wednesdays each week but just from home to school." I hope local drivers and owners of cars take a lead from this initiative and leave their cars at home, at least for a day, better still every Wednesday. I for one will be taking to my bike for this event. Clonmel: A Town in Transition - Rough Cut from MOEVO on Vimeo.